As an investor, you’re making decisions all the time. After all the analysis is done, you still have to decide how much capital to deploy for the idea. One thing great value investors run away from is the widespread concept of diversification with many holdings. I can’t be involved in 50 or 75 things. That’s a Noah’s Ark way of investing – you end up with a zoo that way. I like to put meaningful amounts of money in a few things. – Warren Buffett. Charlie Munger has touched on this point too. The wise ones bet heavily when the world offers them that opportunity. They bet big when they have the odds. And the rest of the time, they don’t. It’s just that simple. Another great investor that supports this view is Monish Pabrai. In his book The Dhandho Investor, he dedicates a whole chapter on a formula to sharing how to tailor the amount of capital you should put to work in a certain idea. That formula is called the Kelly Criterion. Developed by John Kelly, who worked at Bell labs, the Kelly Formula was created to help calculate the optimal fraction of capital to allocate on a favorable bet. The great thing about the formula is that it’s flexible enough to work where information or skills can give you an advantage by estimating the outcome probabilities. The edge is calculated by the total expected value, obtained by adding up the multiplication of each scenario’s possible outcome by its corresponding probability. The odds are directly the positive outcome that can be obtained. But first, it’s important to realize that there is a big difference between “probability” and “expected value”. Probability measures how certain a particular event will happen in a specific instance. If you flip a coin 10 times where you get one point for heads and zero for tails, the deviation from the expected value of 0.5 is going to be small. But in percentage terms, the difference is huge. Now if you did 1,000 coin flips, the absolute deviation will be larger. That is, there will be more flips outside the 0.5 expected value. However, the percentage deviation will be much smaller. Over a small sample size, the Kelly Criterion doesn’t work well, especially if you don’t trade often. The formula is intended to work best for the long term growth of your bankroll over thousands of trades. That’s where it’s different and difficult to apply to investing. Unless you are day trader making tens or hundreds of trades a day, you won’t reach the number required for optimal allocation. But there is a way for value investors to use it. With the above discussion in mind, here’s an easy example taken from The Dhandho Investor. You’re offered a coin toss where heads you get 2 dollars and tails you lose 1 dollar. How much should you allocate to this bet? Primarily, the Kelly formula can provide you with a range of upper and lower bounds to determine the size of our investment. Let’s take it one step further and apply it to a stock portfolio. Do you remember the AAPL roller-coaster last year? At the low point, the stock was selling for about 400 dollars. Even Jae decided to jump in and buy AAPL. So with the analysis at the time, how much of your portfolio could you have allocated to AAPL a year ago? When talking about stocks, there is a need to think in terms of the price differential compared to the actual values displayed by the market. Now, please remember the Kelly criterion isn’t necessarily a “Do-as-I-say” formula. It is best used as a guideline to find upper and lower values. This is a clear example of where there are difference with investing. The Kelly Criterion clearly sends the message that this is a stock you should bet a lot on. But I wouldn’t allocate 87% of my capital to this idea. It just shows that the odds are heavily in my favor. Up next, a book recommendation. But before that, please click on the image below to download the best free investment checklist that will save you time and make things easier for you. In the book Hedge Fund Market Wizards: How Winning Traders Win one of the hedge fund traders talks about allocation using the Kelly formula. So instead of betting 87%, it’s more realistic to bet less than half. With AAPL at those prices last year, hindsight tells you that even a 30% allocation would have been very good. But as always, the dots connect and your circle of competence will play a major role in determining the probabilities of outcomes. The more you know the business and industry, the more precise the numbers will be. It’s always wiser to be conservative in your outcomes and probabilities, since it implies that even an adverse scenario can produce good results. When the odds are heavily in your favor, don’t panic, but profit from the opportunity Mr. Market is giving you. You don’t want to follow the Kelly formula by the book. Use it as an indicator of how good the odds are and apply 25% to 50% of the recommended sizing. Place few bets, big bets, infrequent bets. Would you use the Kelly Criterion? How do you size your positions at the moment? The Kelly Criterion works well in gambling situations where the probability can easily be calculated. When it comes to investing, I have my doubts about the effectiveness of such a formula. 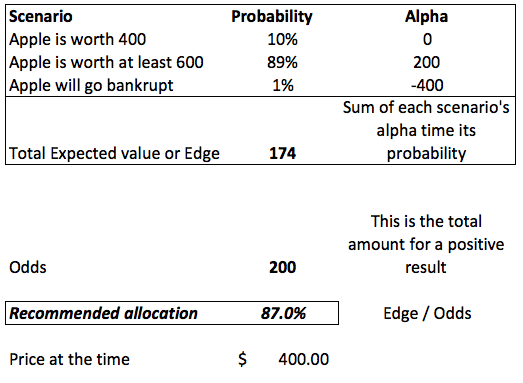 How do you calculate the probability that AAPL is worth $400 or $600 or any other amount? You essentially have to use arbitrary inputs to determine the probabilities. You can’t do this in most casino-style gambling situations, where exact probabilities can be calculated. Those percentages are based on personal preference and can be anything the individual investor desires. In investing, this method works just as well as the Kelly Criterion but it’s a lot simpler to use. How did you calculate odds = 200? good points. Risk reduction, portfolio sizing, stock valuation, selling prices. It’s all art in the end. The thing is to just use whatever method works. I like your simple example too. I believe the Co-Author was basing it off the intrinsic value he calculated. Hi Brain, this is a really interesting article. I’m going to have to break out the spreadsheets to get my head around it when I am a little less tired. One of the things that I have to laugh about with Buffett is his access to deals with far better terms than the average investor. During the market crash, I bought a couple of BoA mid-term corp bonds yielding 5% and I thought it was a great return. A week later, Buffett closed his deal for preferred stock with a 6% dividend (and the possibility for market appreciation). Only Buffett got that deal – not main street. I think it should be as part of a %, right?. I´m confused with the meaning of 200. I use Kelly as a sizing tool (esp. when a stock has risen in price but still has upside). I can give you an example that is a little different. I own a stock called Alliance Health Care (AIQ) and I have calculated an upside of 90% from its current price. So I calculate the upside as 90% the downside 100% and typically use a 50/50 as probability up and down (a conservative estimate of my win loss ratio). So my edge is .45 and my odds are 1.9 so I get a 24% allocation. So when the position size approaches 24% I will sell even if this position has the highest return potential. Instead of estimating the probability based on stock value, why not look at your own track record as an investor? As a simple example, if 50% of your investments have historically made money and 50% have lost money, the probability involved in your next purchase making money is 0.5. You could make it more sophisticated by calculating the historical probability of your investments hitting their target levels. But you’d also have to consider how much you made or lost with that 50/50 win. e.g. if you hit it big with 1 stock but lost a little on another, that’s still a 0.5 win rate but the actual profit is much different. Hi, I found very interesting how Ariel has approached this. Please, red ‘The Patient Investor’ Annual Report September 30, 2013 Ariel Investments. they are much less attractive from a risk/ reward perspective.